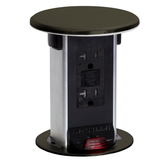 The PUR20-S by Lew Electric is a waterproof round pop up power outlet designed for kitchens or any countertop application where you need power in wet or potentially wet locations. The stainless steel top looks elegant in any kitchen, hotel, restaurant, bar, or any countertop surface. 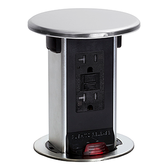 The pop up features two 20 amp outlets that are GFCI protected, the outlets are also tamper resistant. The pop up is super easy to install and use, simply cut a round 3 3/4" hole in your countertop, drop it in and secure with the provided plastic flange to the underside of your counter by just threading it. There is an attached 9' long power cord with a 3 prong end that needs to be plugged into an outlet. To use, press the top and the unit will pop up slightly, then just pull up the rest of the way till it locks. When done press the unlock button and push shut till it latches. The PUR20-S was designed to be attractive yet functional, as well as pass code and be easy to install. The PUR20-S is ETL listed for the USA and c-ETL listed for Canada use. 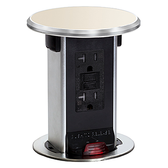 The power outlets are UL-1363 listed and the entire unit is ETL listed 4004534 and NEC code 406.5E approved for countertop use. The top is spill proof rated and has an IP54 rating, the top is seamless so no water can get inside the unit. There is also a gasket under the bezel where it meets the countertop so water can't get in from the sides. 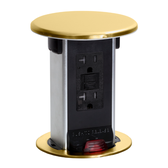 The outlet is 20 amps and self testing GFCI compliant and features tamper resistant outlets. The PUR20-S meets NEC code in several ways and is a perfect solution for your countertop power needs when you need quick access to power when a wall outlet is not possible.